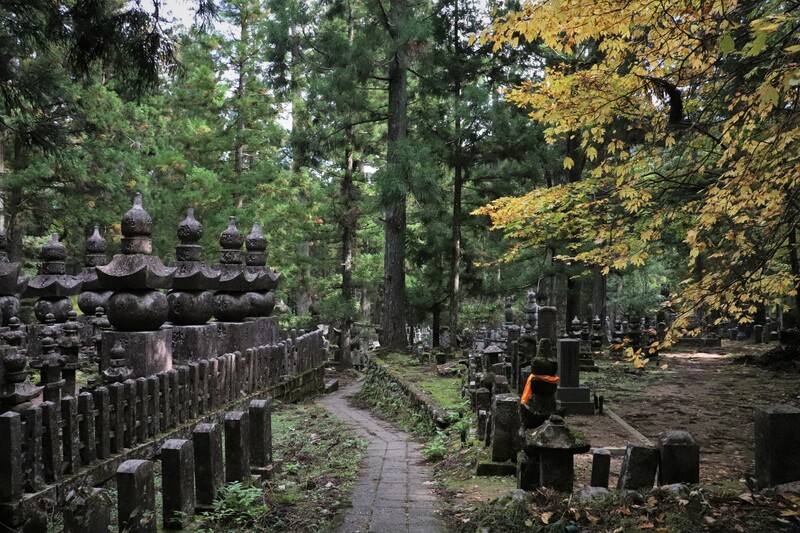 The two most sacred places in Koyasan are the Danjo Garan and Okunoin. 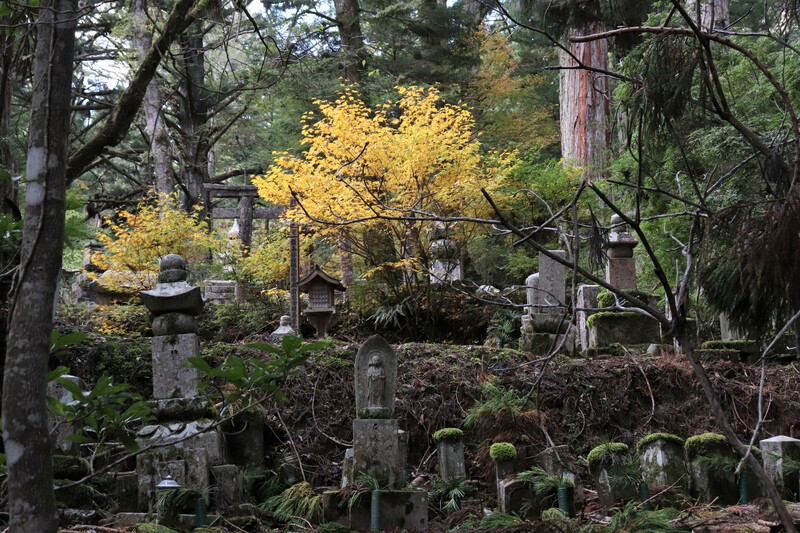 The Danjo Garan for people to study and practice Buddhism and the Okunoin is its cemetery. 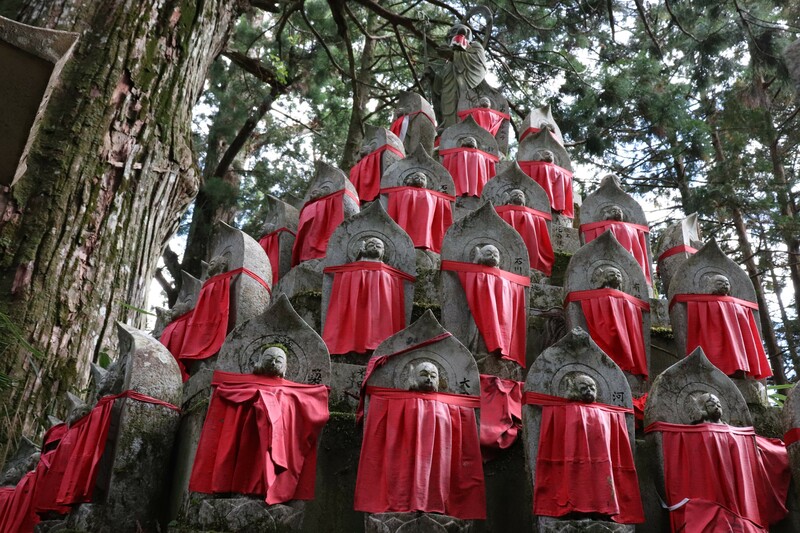 While the Okunoin is a place of rest for many, it is not for one. 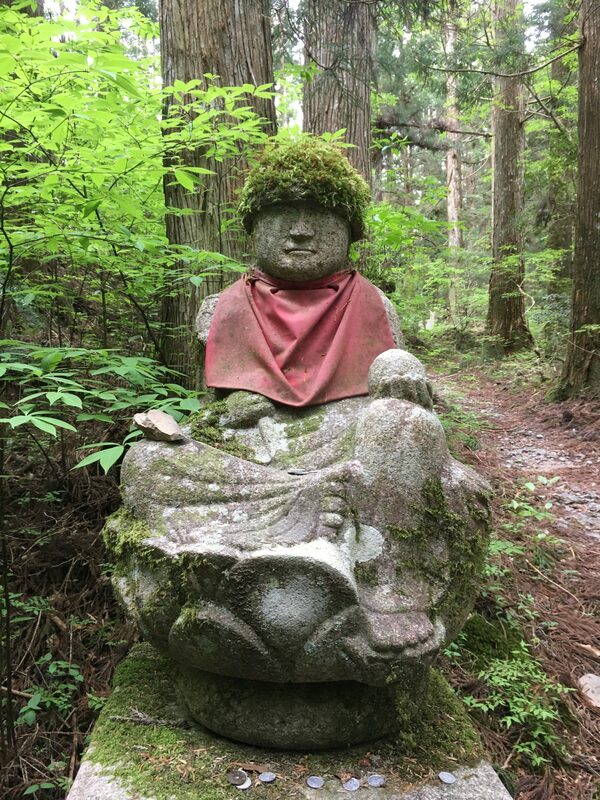 Kukai passed away in 835 in the Okunoin, However, Shingon Buddhists believe that Kukai did not pass away but went into an eternal meditation, nyujyo. 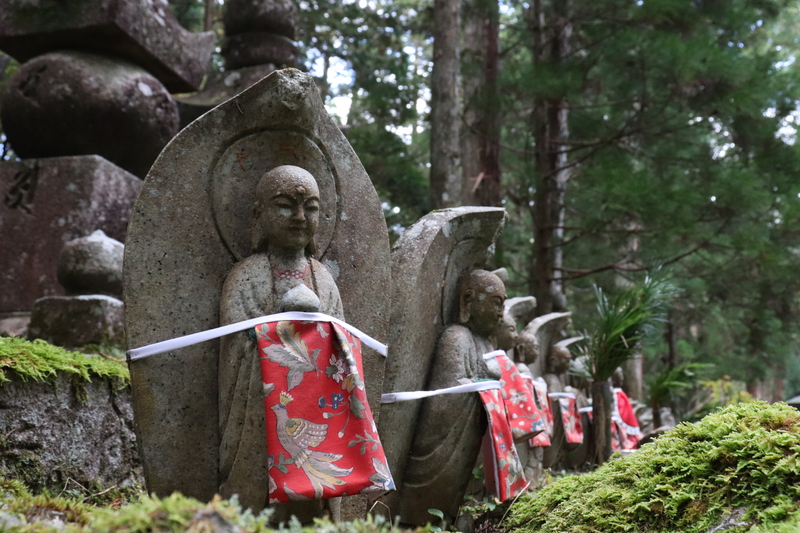 Please see our post on the Danjo Garan to find directions to get to Koyasan from Osaka. 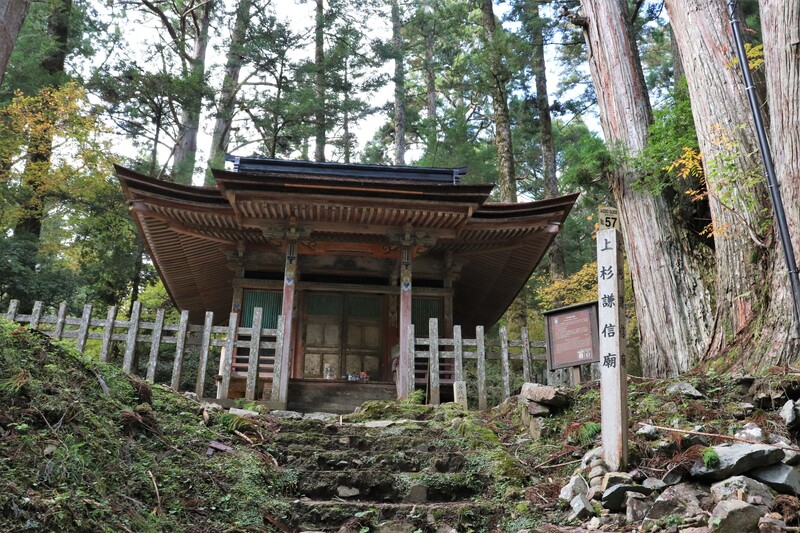 From Koyasan station of cable car, take a bus to the Okunoin-mae bus stop. 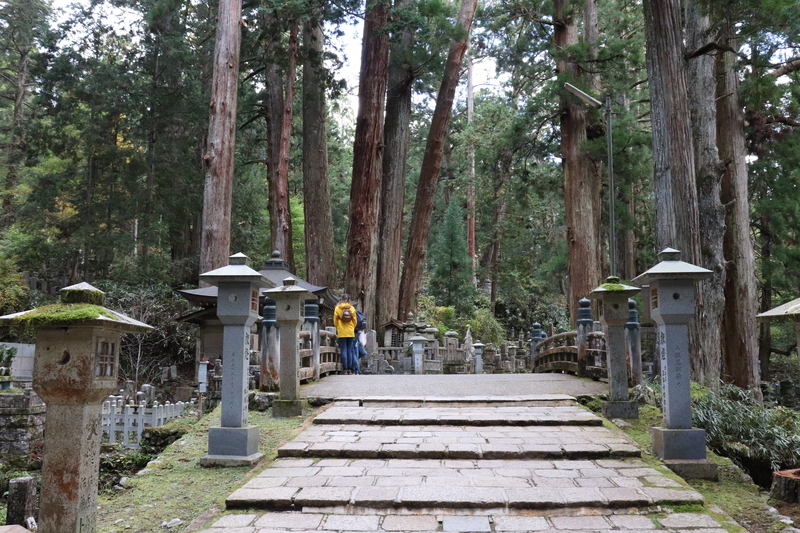 From the bus stop walk about 10 minutes and you will be at Okunoin. 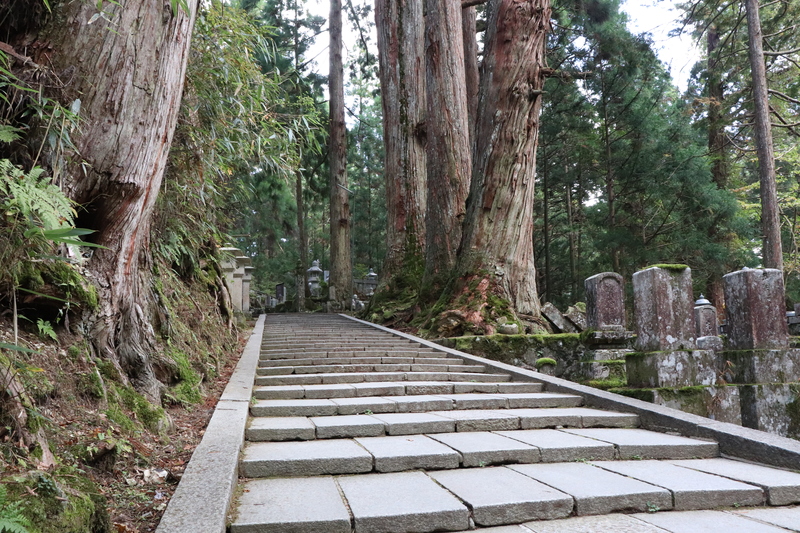 This route is very direct and will take your almost straight to the Okunoin. However, this way you will miss most of the cemetery. 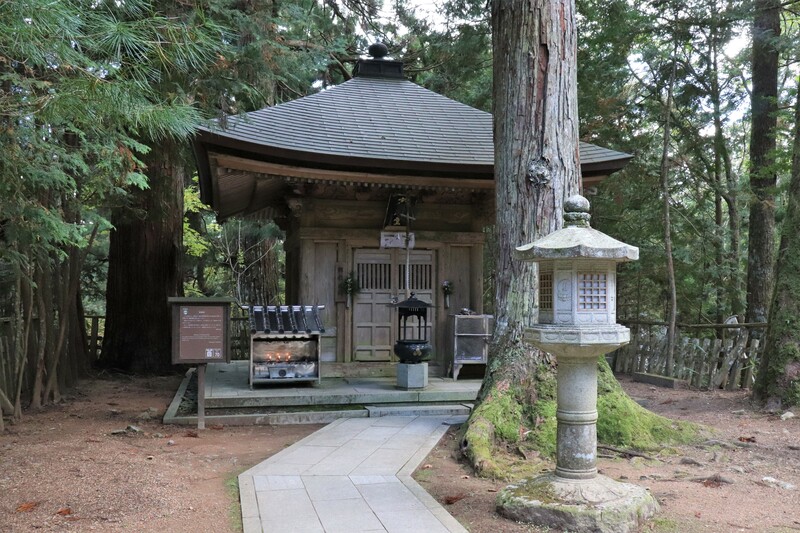 Our recommend is to get off at the Ichinohashi-guchi bus stop and then walk to Okunoin. 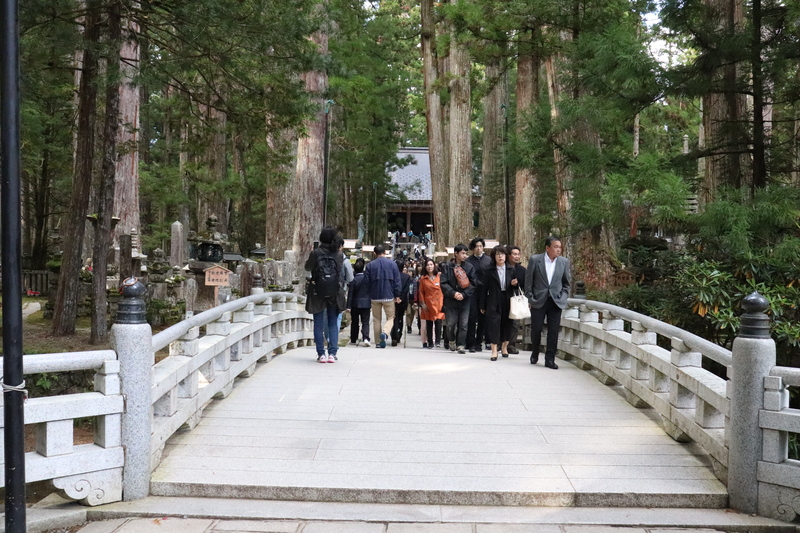 The entire trail is 2km but you can enjoy the sacred atmosphere of Koyasan. 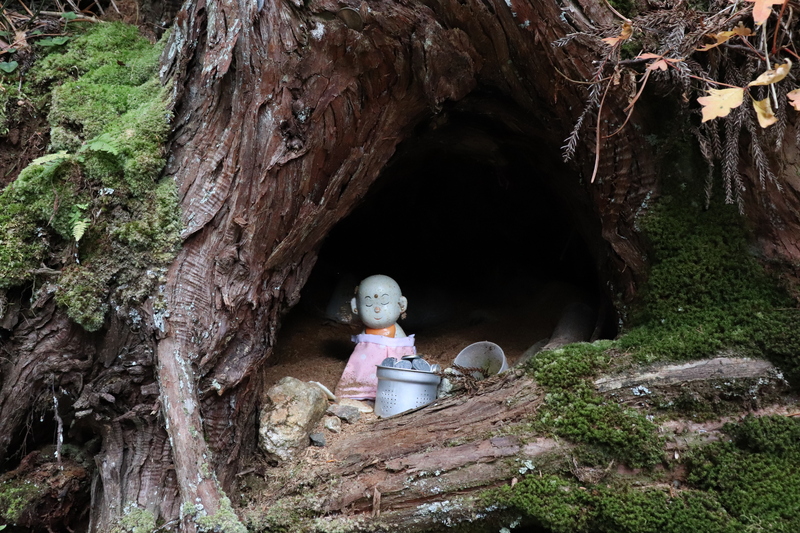 Keep in mind that in winter it snows a lot in Koyasan, so you will probably need snow shoes then. 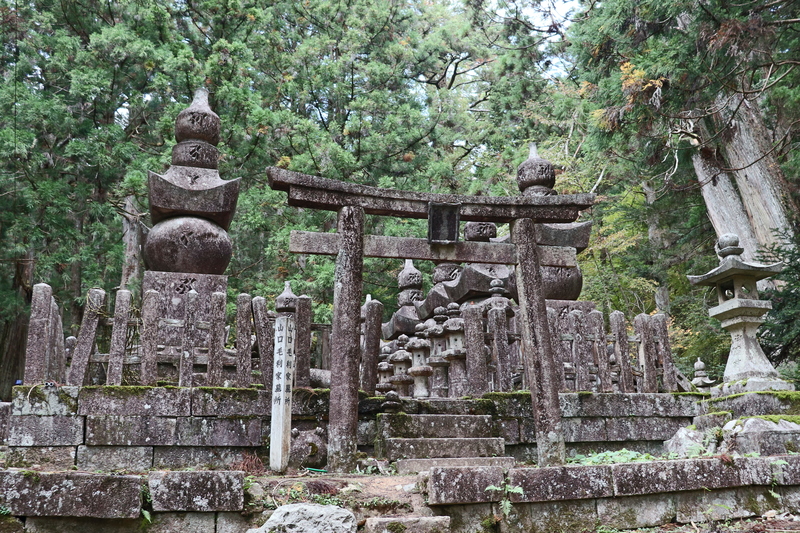 The entrance of Okunoin is right in front of the Ichinohashi-guchi bus stop. It looks like a dense forest, but path is completely straightforward, so you won’t get lost or even need a map. 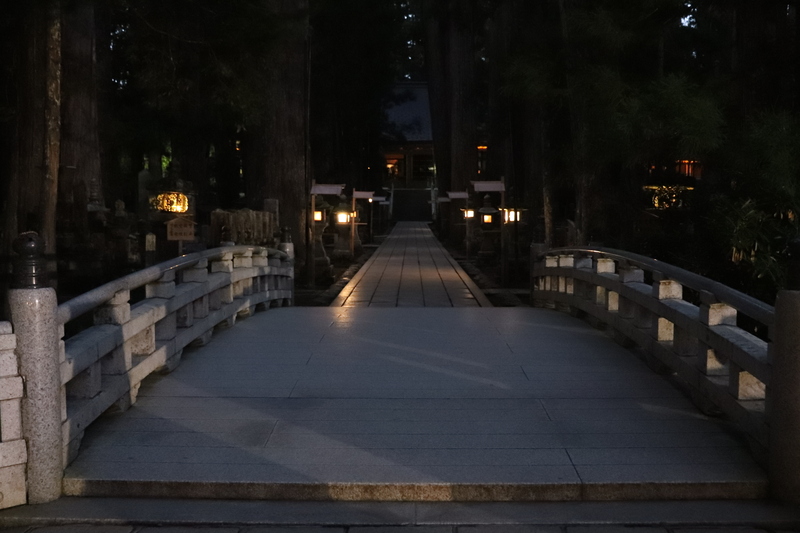 Entrance of the Okunoin: You are now entering a different world! 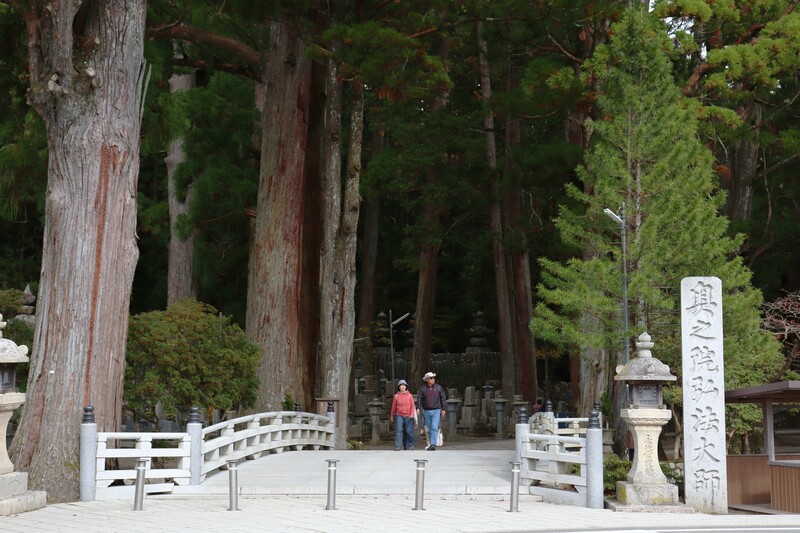 Along the path, there are many tall centuries old cedar trees. 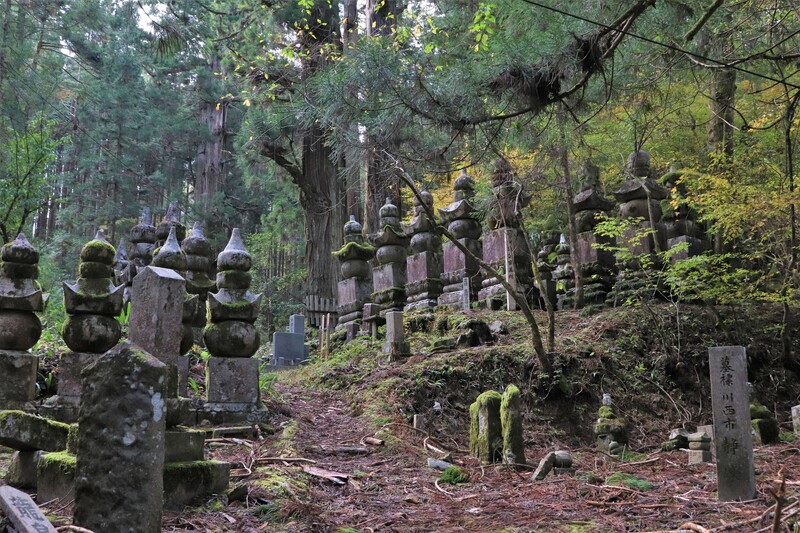 There are also tens of thousands of graves, hoping to rest in peace near Kukai. You even can find a number of gravestones of famous people. Obviously it would be tedious if we mention every single one, but here are ones we think really stand out! 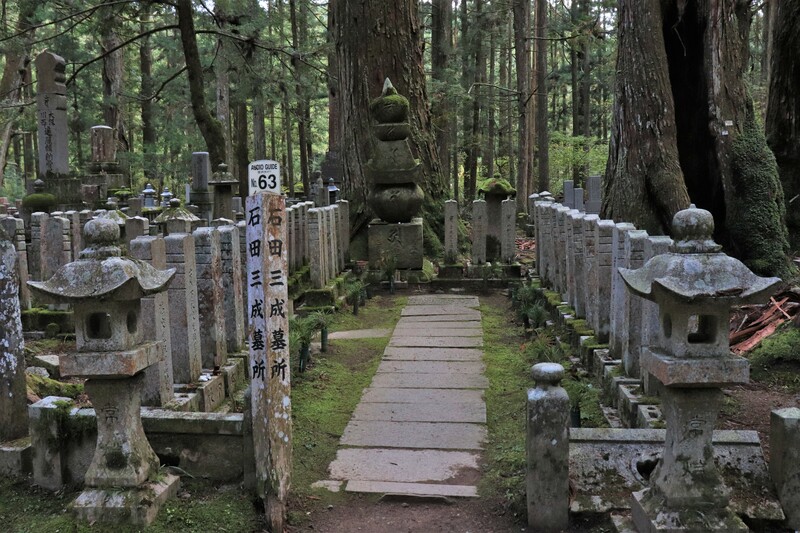 A number of these grave markers include some famous samurai and warlords from the Sengoku Period. Takeda Shingen: one of the greatest rivals of young Tokugawa Ieyasu. 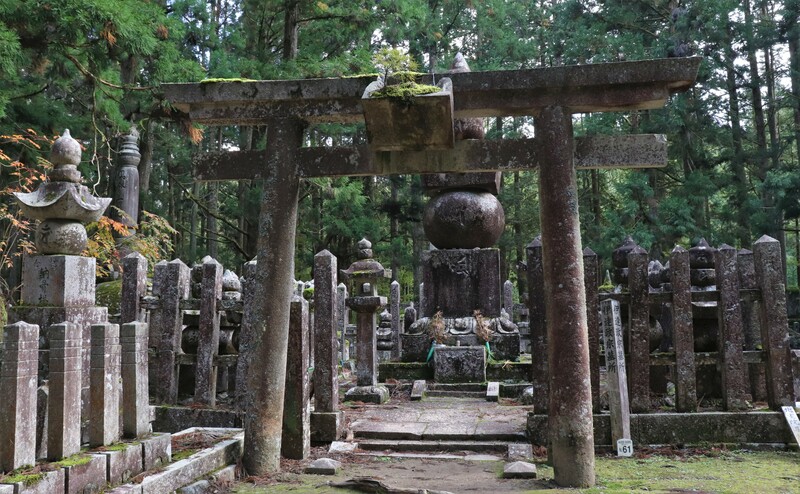 Mausoleum of Uesugi Kenshin: a famous and wealthy warlord from the Sengoku Period. 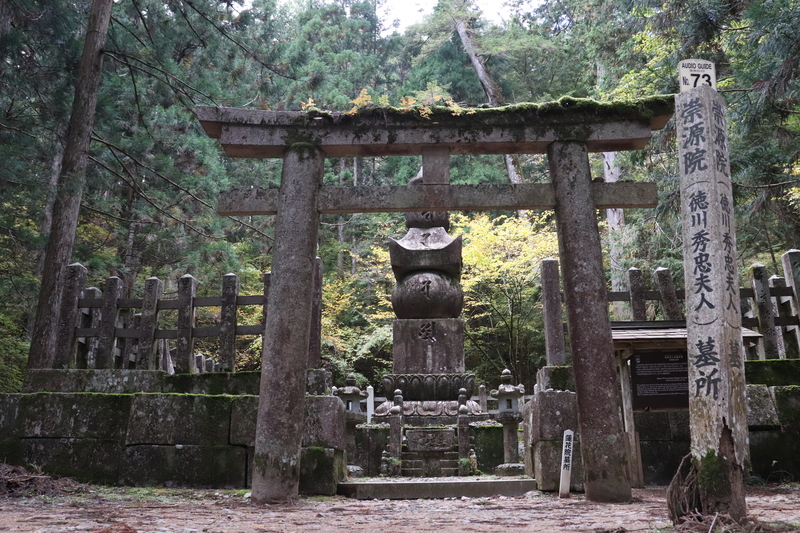 Only warlord to have a mausoleum in the Okunoin. Date Masamune: a famous warlord from the Tahoku region. Ishida Mitsunari: Ieyasu’s biggest rival after the death of Toyotomi Hideyoshi. Kobayashi Sahee: a heroic figure in Osaka who helped the poor in many way such as building homeless shelters and hospitals. 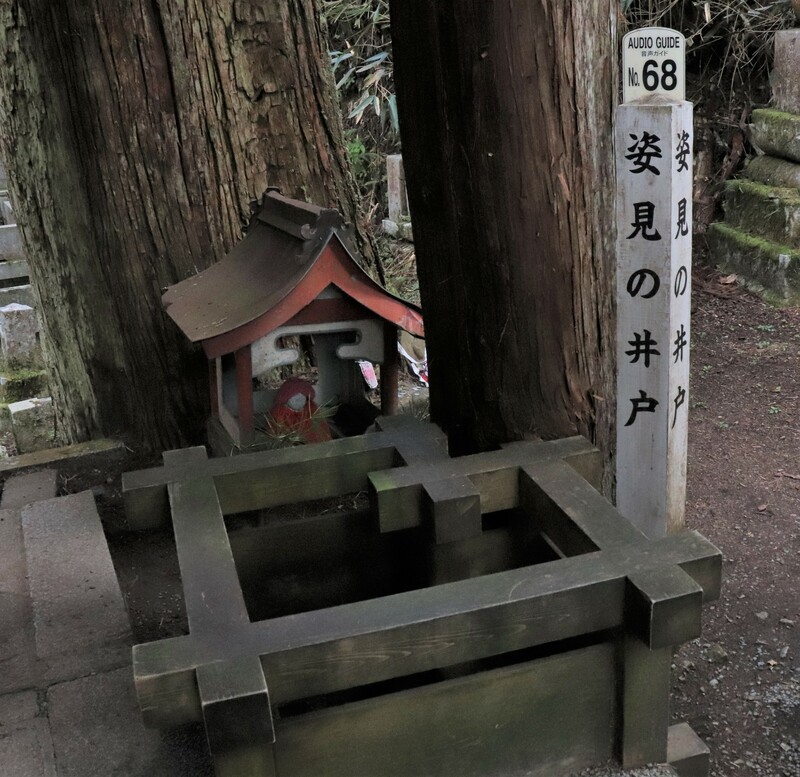 At the end of Nakanoshi Bridge, there is a well called Sugatami no Ido [姿見の井戸]. If you can’t see your reflection in the well, you will die in three years. When you see Kakuban-zaka slope, you are almost half way! What is scary, is that if you slip on this slope, people believe that you will die in three years. 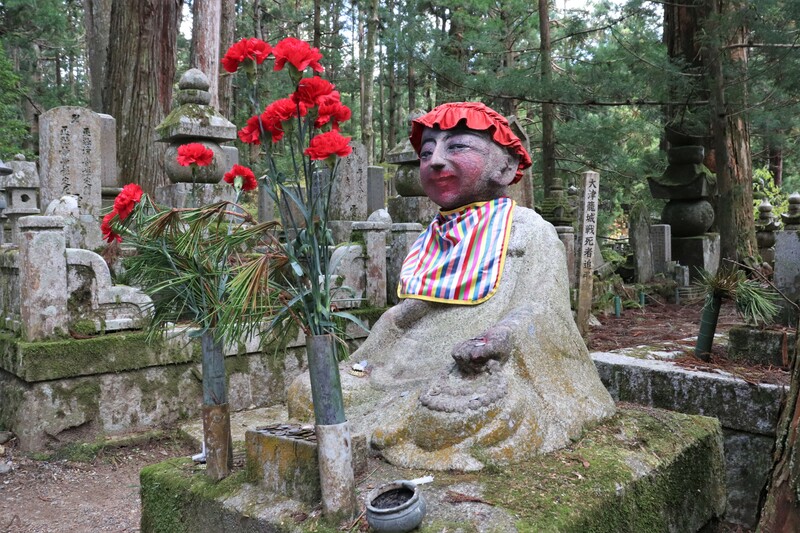 Kakuban was a monk who once practiced at Koyasan. 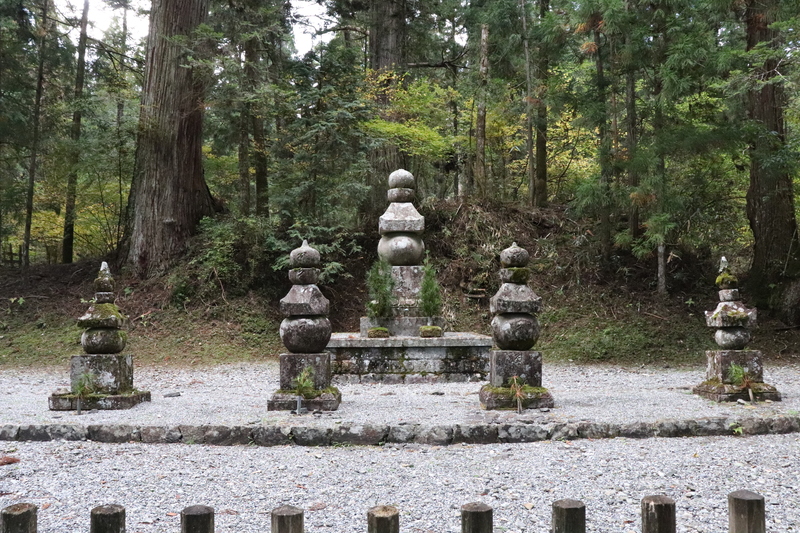 In this area used to be a temple called Mitsugen-do created by Kakuban, but now only this small temple commemorates it. 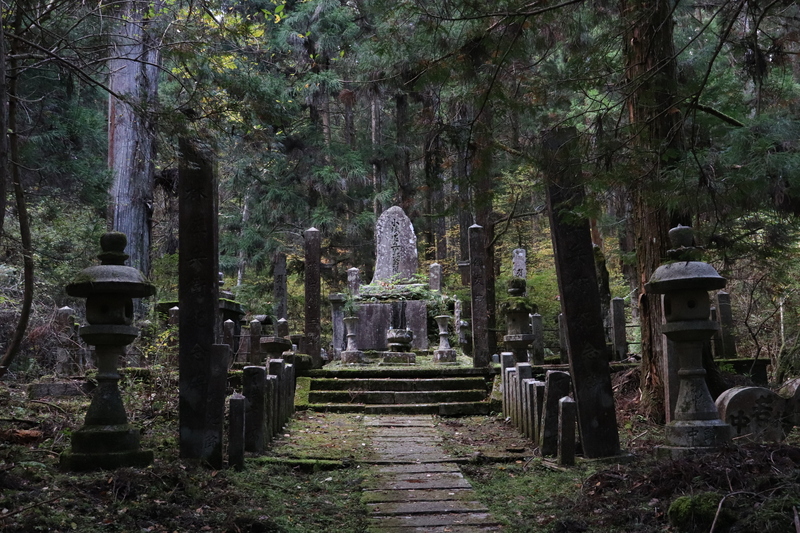 For more on him see our post about Negoro-ji Temple! 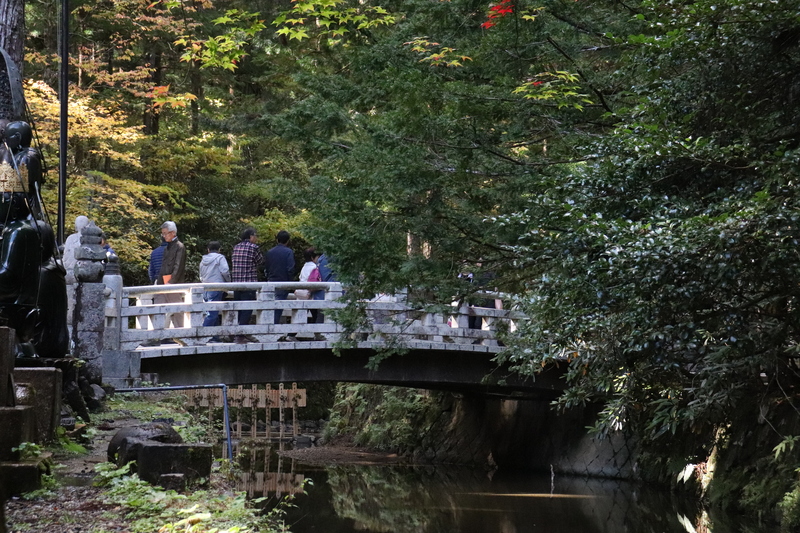 Lots of people really enjoy visiting Koyasan at different times of the year, and fall is especially popular. If you want to stop by and see the autumn leaves head up around the end of October. 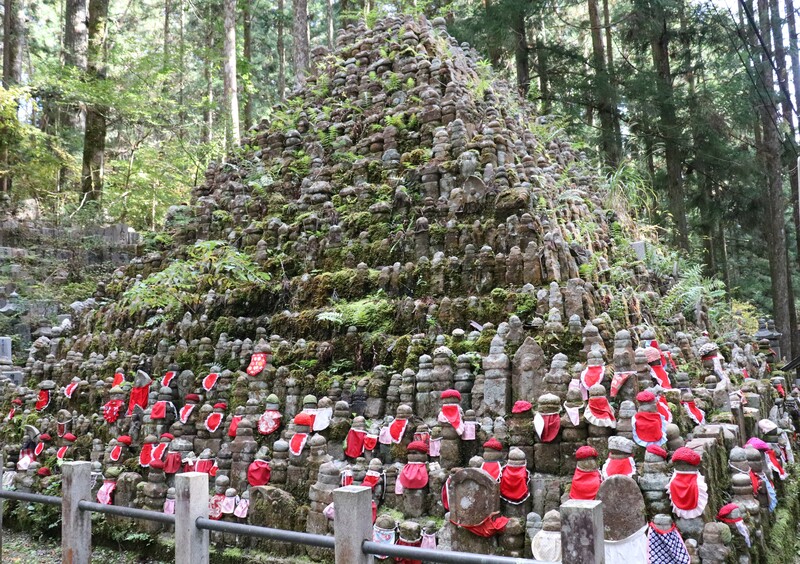 There are also literally hundreds, maybe even thousands of jizo in the Okunoin. After a while, you will be a little temple called Gokusho, where you can get a shuin. (There are bathrooms too.) During a day, there are so many people, especially tour groups. 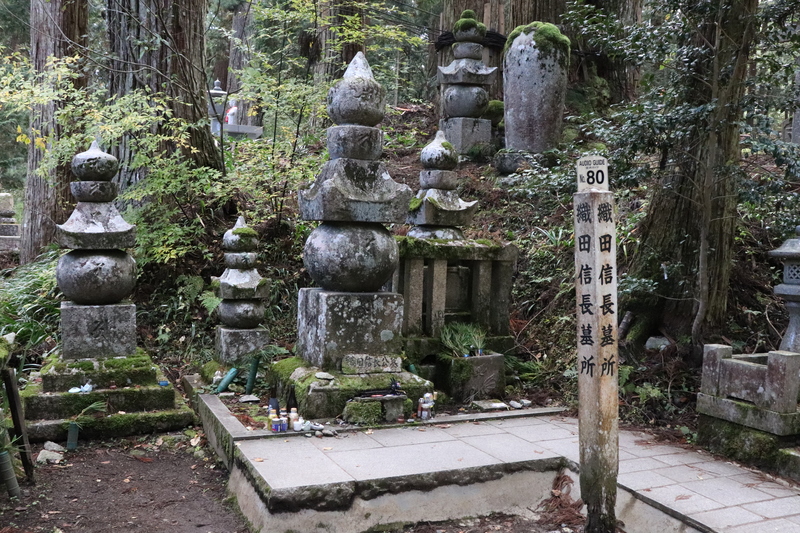 The Okunoin-mae bus stop is only a five minute walk from here. Once you cross the small Tamagawa River, the area becomes a most scared place where Kukai is in practice. Unfortunately, you are not allowed to take any pictures beyond this point because it is a serious religious site. 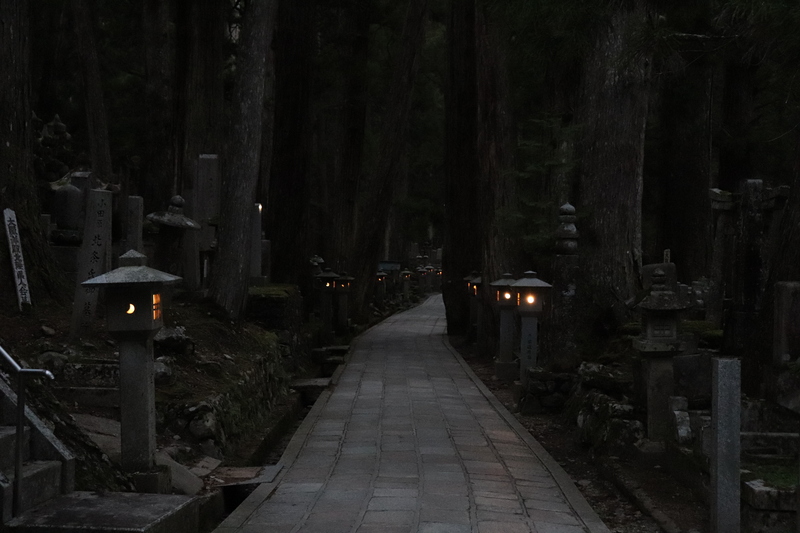 At the end of the path is the Toro-do, a buildings with hundreds of lanterns hung from the ceiling and a fire, kept burning for a thousand years. It is hard to describe what it looks like in words, but surely, it is gorgeous. 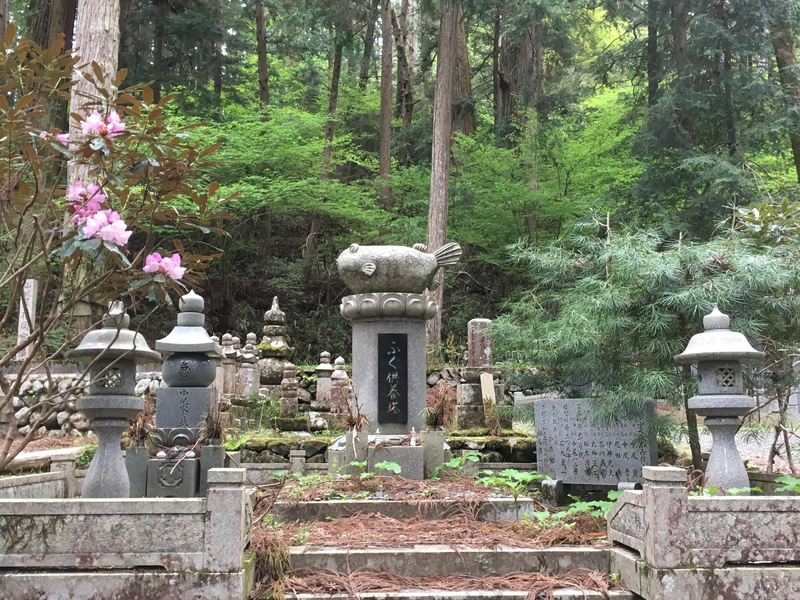 After visiting the Toro-do, makes sure to go around the building so that you can get as close to the grave of Kukai as possible! Buildings and restaurants in the Okunoin close at 5 o’clock or so, but the path itself is open 24 hours. 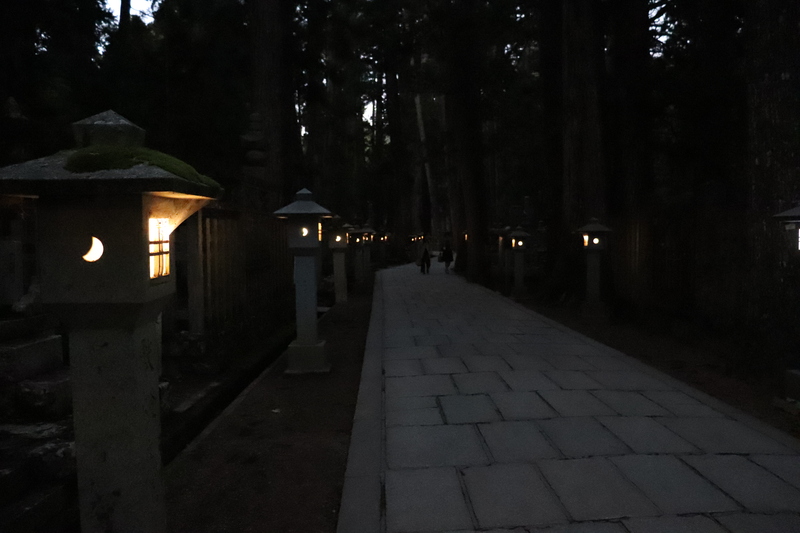 Because many temples near the Okunoin lock up at night, there is almost nobody on the path. 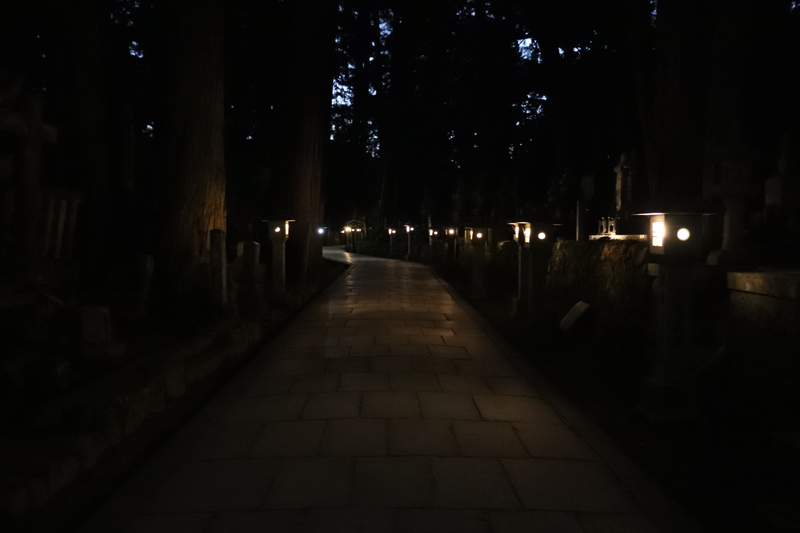 Since it is a cemetery, it may seem scary to be in the Okunoin at night, but it is very pretty. 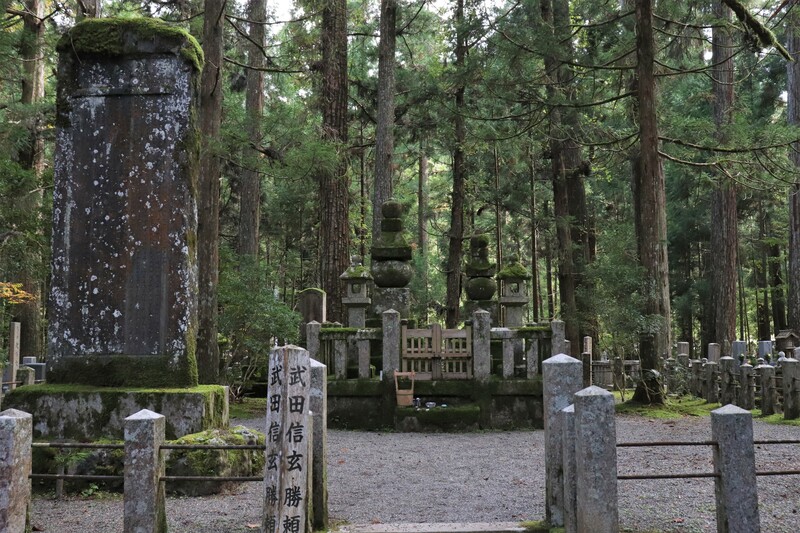 Bus service from Okunoin is available till 9 o’clock, you can walk around and take a bus to Koyasan Station. 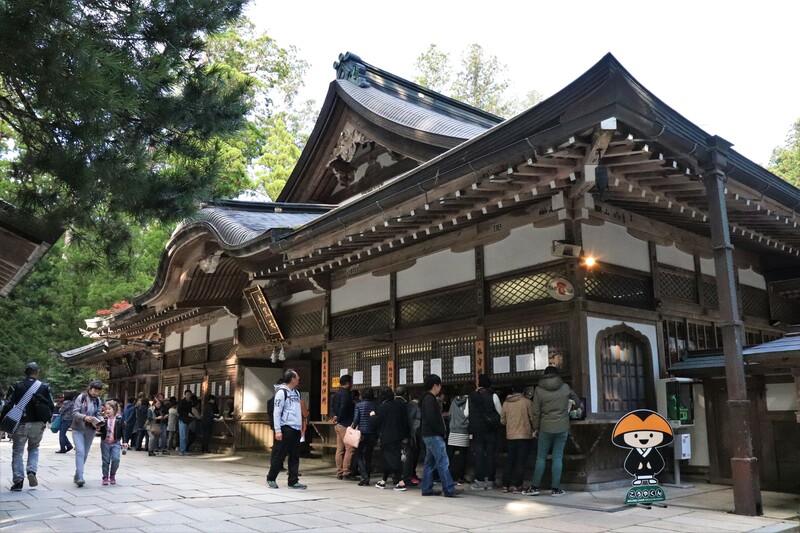 The Kongobu-ji and other famous buildings at Koyasan!